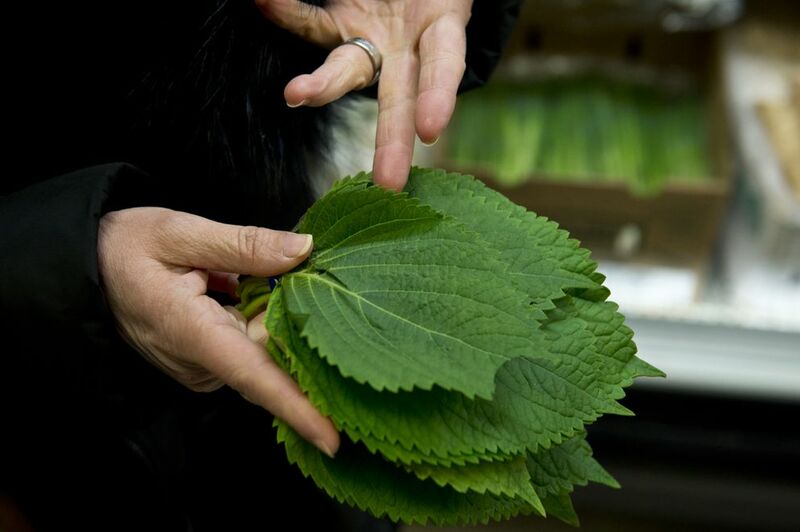 On a recent morning at New Central Market, an Asian grocery on Northern Lights Boulevard in Anchorage, Kim Sunée pinched a piece of a palm-sized, green perilla leaf and slipped it between her teeth. Its herbaceous flavor — part mint, part tarragon, part anise — might be as common in Korea as the flavor of basil is in the United States. Though Sunée was born in Korea, perilla's taste has only recently become familiar. Sunée, a recipe columnist for the Anchorage Daily News, was adopted at age 3 by an American family who raised her in New Orleans. She came to Anchorage in 2011 to join the man she'd later marry, a few years after she'd written her best-selling memoir, "Trail of Crumbs," a coming-of-age story that deals with identity and food, and explores her connection to Korea. Her most recent cookbook, "Everyday Korean," covers some of the same ground, this time through an exploration of flavors and cooking with co-author Seung Hee Lee, who was raised in Korea. It came out in November. "I'm an enthusiastic cook," Sunée said. "But I'm learning just as the reader is learning." Part of that learning has been exploring Anchorage's many ethnic groceries. Koreans are one of the larger Asian groups in Anchorage, numbering as many as 7,000, according to community estimates. Building a pantry of ingredients for Korean cooking is surprisingly easy here, she said. 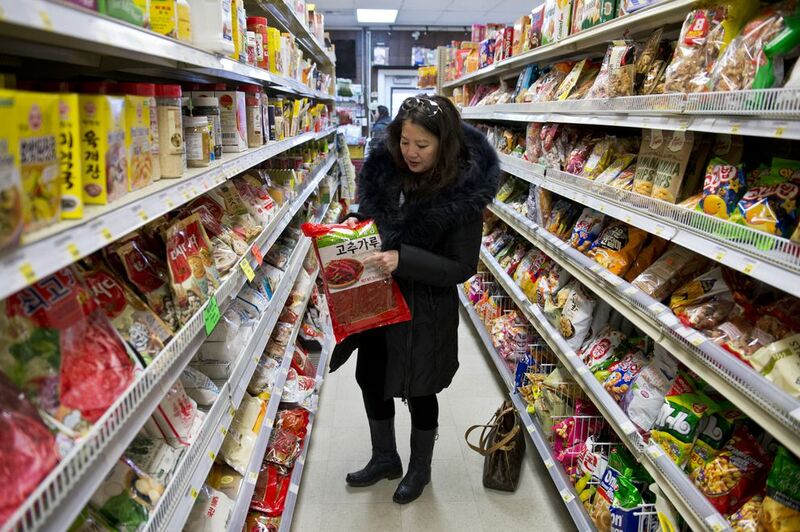 At New Central Market, she picked up a tub of gochujang, a fermented red pepper paste. Its flavor is savory, deep and spicy, she said. Gochujang is the backbone of many Korean dishes in the cookbook, including salmon and a number of sauces. "It's as familiar to Koreans as ketchup is to Americans," she said. 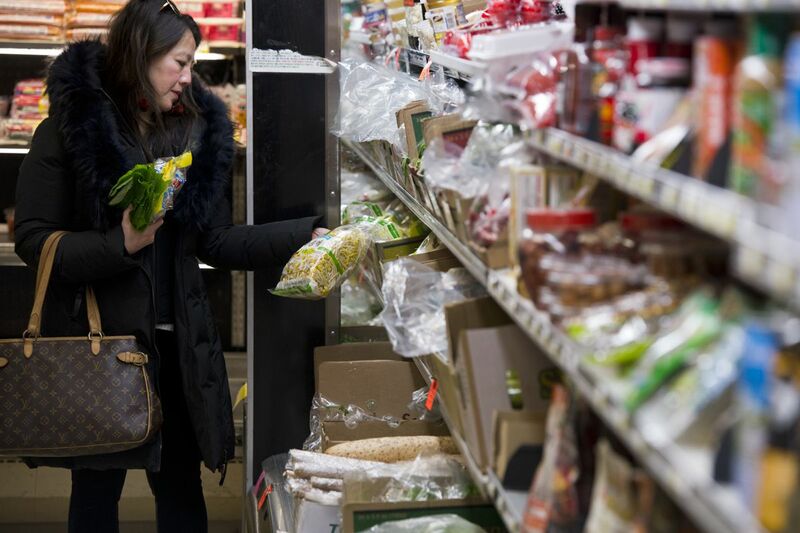 She wandered by the freezer section, pointing out the Korean rice cakes, or tteok, small, starchy dumplings used in soup and tossed with sauces in the book. And the beef pre-cut for kalbi, or short ribs. "If you buy like five or six basic ingredients, you can cook almost every recipe in the book," she said. The shopping list: soy sauce (if you can find Korean-style, all the better), quality sesame oil, rice vinegar, short grain rice, sesame seeds, gochujang, and gochugaru, Korean-style red pepper flakes. Sunée, who also writes a food blog, met her co-author, Lee, when she was on a book tour in 2008 for the Korean language version of "Trail of Crumbs," she said. Lee was assigned to be her interpreter just before Lee headed to a nutrition Ph.D. program at Johns Hopkins University. They connected right away by traveling around, eating together. "Being with her, it was a lot easier to talk to the people," Sunée said. "I tried things I would never try on my own, like boiled silk worms, which actually tasted like hay or straw. It wasn't that bad." Lee, who now works as an adjunct professor of nutrition at Georgia State University and an epidemiologist with Centers for Disease Control, grew up cooking with grandmother in Cheongju, South Korea, two hours south of Seoul, Lee said. Sunée enlisted her to be a guide as she learned about traditional Korean cooking. "Learning about the food of my birth country is always something that I wanted to do," Sunée said. "I felt disingenuous, in a way, just me doing it." Sunée — whose first cookbook, "A Mouthful of Stars," a collection of international recipes, came out in 2014 — helped adapt and riff on Lee's traditional recipes, with the idea of making them accessible to wide American audience. Among "Everyday Korean's" re-envisioned dishes are Korean chilaquiles, gochujang-cured pork belly, chicken wings with gochujang ketchup and perilla-leaf pesto. The book's recipe for kimchi stays true to tradition as a matter of principle, said Lee, reached by phone in Atlanta. With the fermented food trend, kimchi is having a breakout moment in mainstream food culture, but for Koreans, improper preparation — like using sriracha and not actually fermenting — is deeply upsetting, she said. "You can put kimchi on a hamburger or a hot dog, you can do whatever you want with it, but you have to make it right," she said. As she worked on the book, Sunée noticed the ways that Korean cuisine fits with how Alaskans eat. 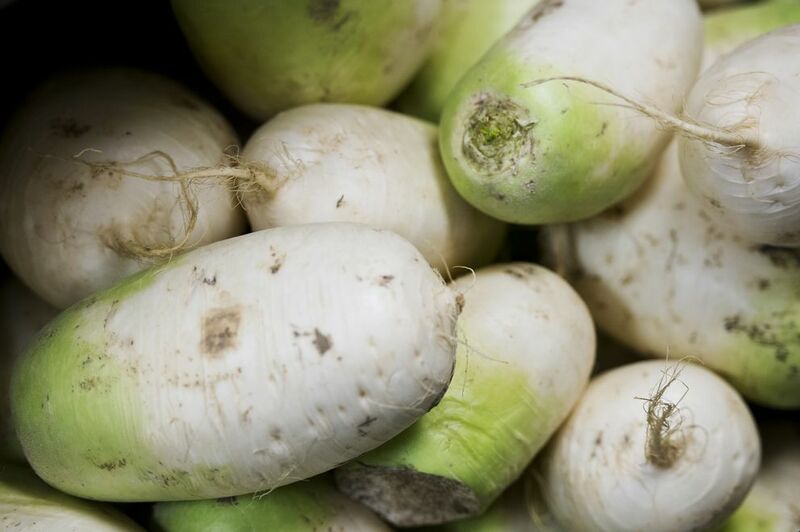 Korean cooking relies on a number of vegetables that grow well in Alaska, like carrots, radishes, cabbage, snow apples and potatoes, she said. "All of our root vegetables are amazing," she said. Koreans also view food in a way that echoes Alaska's subsistence-influenced culture of food sharing, she said. "Korean food is about sharing, it's very bountiful," she said. "No matter your income level, there is always the bowl of rice and all these side dishes." Lee and Sunée talked a lot about food memories and how that shapes a sense of connection to culture. During their book-writing process, Lee was in Anchorage, making some traditional New Year's meatballs or jeon. They smelled like New Year's, she told Sunée, just like turkey in America smells of Thanksgiving. "I was communicating with her in the language we both knew, which is food. And I think she really craved learning about her heritage in that way," Lee said. Taking in that aroma in the kitchen made Sunée think of her birth family, somewhere in Korea, whom she may never find, she said. "That's why I wanted to write the book with all these tastes and flavors," she said. "That may be the only thing concrete I have from there."